P&R Locksmiths services Ltd was established in Woodbridge Suffolk in 2002 by brothers Ray & Phill. 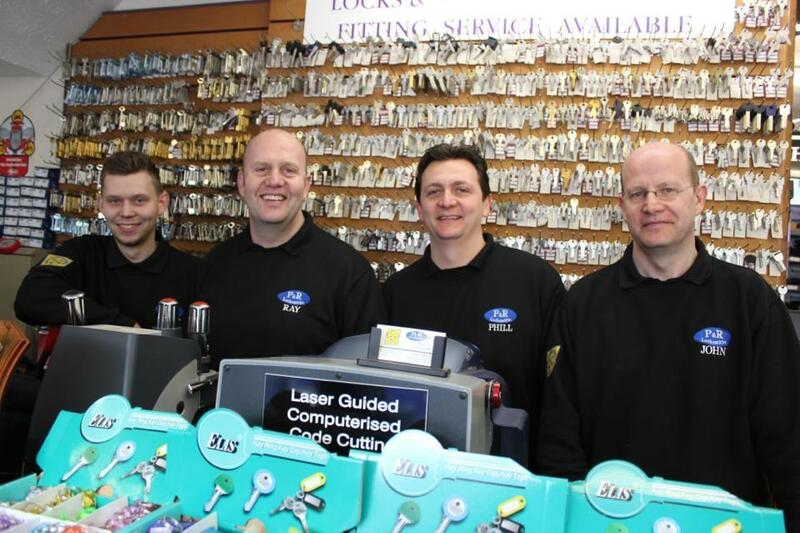 It has quickly become a successful local business which provides a full Locksmith service to Woodbridge, Ipswich, Felixstowe, Stowmarket and all the surrounding areas. Since the start of the business in 2002 things have gone from strength to strength. In 2004 brother John gave up his long career as a chef and joined the firm to help run the shoe repair and engraving side of things. Whilst Ray and Phill carried on expanding the locksmith and security side of the business. In 2014 Nephew Scott joined to complete the team, and helps provide the quality of service to which P&R Locksmiths have built their reputation on. As a member of the Master Locksmith Association P&R Locksmiths are able to offer a full domestic and commercial locksmith service. From emergency call outs and lock opening service, to a full lock fitting service to insurance approved BS3621 standards. Being members of the Master Locksmiths Association you can be assured that any work carried out will be to the highest of standard and, all work is guaranteed. Here at P&R Locksmiths our goal has always been to give the “good old fashioned service” but still always investing in the most up to date technology and machinery. Whether it’s a shoe that needs stitching on our 100 year old re-furbished singer sewing machine, or a remote car key that needs sophisticated diagnostic equipment to program, we have the skills and equipment needed. Our key cutting service is one of the many fields we have invested heavily in and acquiring some of the most accurate machinery available. That’s why we guarantee all our keys and take great pride in being able to cut the widest range of keys possible. 95% of all keys produced at the shop are cut on computerised machines. These machines produce the most accurate duplicate key and, in a lot of cases can actually produce a key back to the manufactures specifications. This means that that sticky Chubb key you’ve been struggling with can be scanned by the computer worn parts corrected and a perfect working duplicate is produced. When it comes to our engraving service we have taken the same ideals of the best possible service coupled with market leading machinery. In 2015 we took delivery of our biggest investment to date, our Gravograph IS400 Volume computerised engraving machine. This machine has enabled us to provide an engraving service second to none and without compromise. We can engrave on any metals, glass, plastics and even wood. We can engrave everything from simple text on a pet tag, to complicated business logo’s on any shaped items, even the odd trumpet or two. With a choice of over 1500 different fonts and characters there’s something for everyone. So give us a call on 01394 388131 or stop by at the shop 1c Thoroughfare Thoroughfare Thoroughfare Woodbridge for all your Locksmith, Engraving and Shoe Repairing needs.